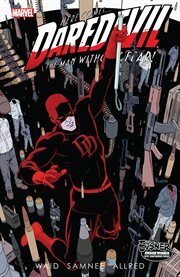 The item Daredevil by Mark Waid, Volume 4, issue 16-21, writer, Mark Waid ; artists, Chris Samnee, Michael Allred, (ebook) represents a specific, individual, material embodiment of a distinct intellectual or artistic creation found in Charlotte Mecklenburg Library. Nelson & Murdock is no more! Foggy's discovered a shocking secret that Matt's been keeping - and he doesn't take it well! It's a turning point in the lives of Marvel's most famous legal team! Then, it's the return of someone Matt thought was gone forever, and the debut of a new menace in New York...the killer called Coyote! Daredevil's newest threat is not what Matt expects...but then again, just how sane is Matt Murdock right now, anyway? The biggest Daredevil story yet begins here, as the streets of New York run red with blood and Matt's mind unravels under the Coyote-created chaos!